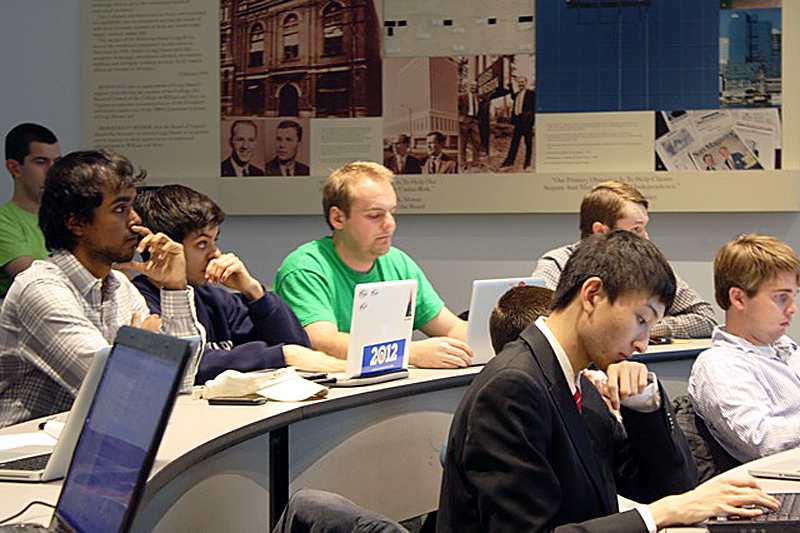 The Code Revision Committee discussed a number of potential changes to the Code of the Student Assembly, including the incorporation of the Undergraduate Council with the senate, utilizing the positions of the SA Archivist and the SA Historian more effectively, and enforcing many forgotten rules and requirements of various branches. The committee is moving section by section through the SA Code, revising as it goes with the goal of producing proposed changes to the senate, Undergraduate Council and Executive branches. The committee has met twice thus far, once in December and once on Saturday Feb. 16. According to the committee members, these changes — despite possible controversy — are essential for reform in the College of William and Mary’s SA. The Code Revision Committee’s current plan is to finalize a proposal to the rest of the SA by the end of the current 2012-13 session. These changes could mark an important change in SA history. “What we’re talking about here is literally one of the biggest changes to our student government since they broke up the hall councils [in 2003],” 2013 Vice President of Advocacy Ryan McManus ’13 said. The Code Revisions Committee plans to meet with Chairman of the Review Board Scott Hardy J.D. ’14 to finalize how these changes can be implemented in accordance to the SA Code and Constitution. Possible reforms for the Undergraduate Council were central topics in both Code Revision Committee meetings. Committee chair and Senator Drew Wilke ’15 and 2013 Vice President of Advocacy Ryan McManus ’13 served in both the Student Assembly senate and the SA Undergraduate Council during their time at the College of William and Mary and offered a number of problems with the governmental branch, including a negative culture, lack of legitimacy and accountability and overlap with the other branches of government. Much of the members’ discussion centered on how the class presidents would be selected alongside the senators. Possible methods included the senators appointing a class president amongst themselves, the senator with the most votes becoming class president, and the separate election of a class president. Madame Chair of the Senate Kendall Lorenzen ’15 spoke in favor of senators appointing the class president in a parliamentary style. Ultimately, however, the Code Revisions Committee members decided that the best option would be to have the senator who receives the highest voter support become the class president. The class president, however, would not be able to serve as chair of the senate and could abdicate his or her role if he or she so chose. “It’s a cultural change, and that’s going to take a little push,” McManus said. Members saw the change as a positive in terms of student interaction during the election process. “It will increase voter turnout because you’ll have one thing to vote for [for your class representation],” Danly said. Redundancy appeared with campus-wide events. Although the Executive continues to put on larger concerts, and speakers, the Undergraduate Council does not currently have the ability or funding to put on larger events for their respective classes. Issues arose around the role of the Undergraduate Council in handling the senior class gift. A suggested solution included the creation of a Senate Fundraising Committee to handle fundraising for the SA as a whole and in operation with the pre-established Senior Class Gift Committee. The Joint Facilitations Committee is an inter-branch body between the Student Assembly’s branches of government. This body is tasked with a number of housekeeping roles but has not been utilized in the last few years. Currently it is the job of the Joint Facilitations Committee to appoint the SA Archivist and SA Historian as well as manage the SA Office. Other tasks include handling the Freedom of Information Act, posting SA meeting times and locations, and facilitating the information technology resources. Before discussing changes to the Undergraduate Council, the Code Revisions Committee discussed incorporating the Undergraduate Council into the Joint Facilitations Committee. Final proposals for the reinforcement of the Joint Facilitations Committee are currently under review. The Student Assembly website currently does not list the individual Undergraduate Council representatives or the senators from the Class of 2015 and the Class of 2016. To curb this as well as other issues with the SA website and archives, the Code Revisions Committee will propose to enforce the use of an SA Archivist and an SA Historian. These positions, outlined in the code but historically never filled, will increase transparency for the SA. “Since things haven’t been kept up for so long there is no record for things for the past few years other than the one I have on my computer that only goes back to the 317th Senate,” Madame Chair of the Senate Kendall Lorenzen ’15 said. The Code Revisions Committee also discussed how these positions could increase outreach initiatives, including enforcing the release of reports by the Senate Outreach Committee in conjunction with the Executive Outreach Department. Currently these quarterly reports are supposed to “detail the activities of the Assembly” and “include a link to the Student Assembly website where legislation, vote tallies, meeting minutes, and attendance records may be found.” The last bill and announcement posted on the website dates back to 2011. Other proposed changes include adding exceptions to certain rules; one such rule dictates that senate committees meet at least 48 hours prior to the senate meeting. A new “hurricane clause” would allow committees to meet less than 48 hours before the Senate meeting in case of an emergency, such as a hurricane. The committee also discussed streamlining committee changes. The senate chair will retain the right to move senators from committee to committee but the committee itself may decide to remove a senator as chair and appoint a new senator to the position. “I think someone can be a good committee member without being a good chair,” Lorenzen said. Committee members also discussed enforcing the attendance of Executive Secretaries at senate committee meetings in their corresponding department, which is not currently enforced. In addition, the Code Revisions Committee members discussed a presentation by the Senate Policy Committee for the new Executive on the policies they are required to follow. Members debated the Conference Committee that must be established by the SA President if he vetoes the senate-approved budget twice. The committee, if formed, includes three members of the Executive and three members of the senate. Code Revisions Committee Chair and Senator Drew Wilke ’15 voiced his concerns about the members selected and the appearance of an Executive-dominated committee. At the Senate Finance Committee meeting, Secretary of Finance Brett Prestia said that SA President Curt Mills ’13 will probably veto this year’s budget if it raises the student activities fee, which currently is $98. The budget will be finalized and voted on by the senate in the following weeks. Concern was raised over the Office of Student Activities, recently renamed to the Office of Student Leadership Development, which has access to $10,000 out of the Student Activities Reserve for general maintenance purposes. Only expenditures over $1,500 must be reported to the SA president. Committee members will discuss this aspect of the SA Code with Student Activities Accountant Anita Forrest. Senior staff writer Meredith Ramey '15 is an English and History major from Longview, Tx. She was previously Editor-in-Chief, Managing Editor and News Editor.